It’s a sunny afternoon in a village. Three women dressed in printed cotton saris are crushing wheat with big bright bamboo sticks. Their saris are vibrant, embroidered in red, mustard and green. They look happy at work, striking conversations under the shade of a big banyan tree. Birds and hens eat the grain off the earth while two hay-thatched huts stand at the corner. The pale green backdrop brings this scene to life. The swirling frame of yellow and red dots gives it all the more an exhilarating effect. But something is about to happen. Something dramatic, maybe? Who knows! One must wait for the next scroll to unfold. Art comes alive in Warangal as life is captured vividly on the canvas of the Khadi cotton of a Cheriyal scroll. It is believed that the Cheriyal Scroll Paintings were brought to India by the Mughals in the 16th century however some say, that it is mostly the invention of the locals since they differ from the other forms of scroll painting found in Rajasthan, Maharashtra and Tamil Nadu. Cheriyal Paintings bear a heavy influence of temple art traditions. Performing arts of dance and music were soon added to this style of painting by the Kaki Padagollu community- a clan of story tellers that use these paintings as visual aids while they narrate their stories. Today, the present generation of the Nakash Clan continues this legacy in Telangana and Andhra Pradesh. Miles away, under a burning sun, lies a blossom tree with its dot like leaves and spread out branches. A parrot sits in a mustard cage held by a two people, perhaps contemplating if this bird should be granted freedom and allowed to fly in the sky. Another parrot sits in a smaller cage at the corner. The painting is full of shades of greens and pinks- and queerly so are the clouds. 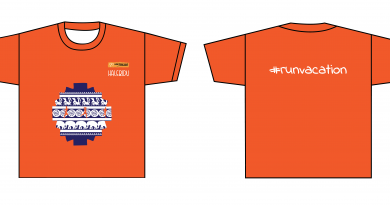 This description might paint a complex picture, but it paints one of bright colors and artistic intricacy. Posing no concrete background or a frame; the Patua scroll paintings of West Bengal are not only a treat to the eye, but also an exercise to the brain, for its complex narrative leaves an open interpretation. The birth of the Patua Paintings can be traced back to the 13th century. The word Patua is actually the corruption of a Bengali word Pota which literally translates to ‘an engraver’. 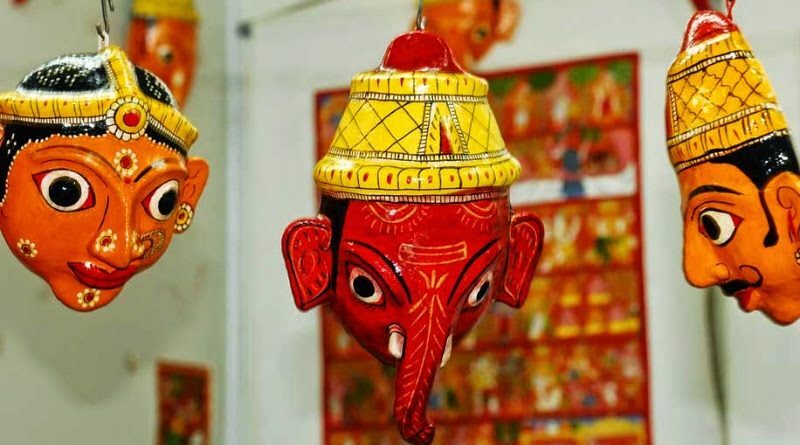 The Potas started out with being a community of Hindu idol makers in the Mindapur region of West Bengal, but most of them were islamized over time. With time, their art form evolved and Pota, or now the Patuas became Scroll Painters or Chitrakars, paying little heed to faith and instead, looking for patronage. They have made their mark in the Hindu, Islamic and Buddhist cultures. The history of the Patua is as colorful as their paintings. The Cheriyal Scroll Paintings from Warangal and the Patua Scroll Paintings from West Bengal have always enjoyed popularity amongst art and culture enthusiasts, but these exquisite gems of our Indian Heritage still remain aloof from the masses, mostly because this artistic culture of Cheriyal and Patua thrives deep, only in the remote villages of Telangana and West Bengal respectively. Their history goes back to the golden period of India, where art of all forms, was patronized heavily by the rulers, unlike today. 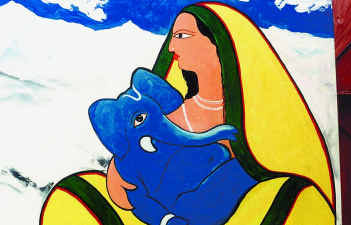 Possessing vivid hues and blazing colors, the Cheriyal Paintings with their floral backgrounds range from simple rural depictions of daily life to folk and mythological tales – the series of which unfold in the form of a scroll being rolled down as the story is told, one by one; creating anticipation in the minds of the readers as each frame is unique. The traditional scroll is about 3 feet in width and the length depends on the size of the story. It is made up on the canvas of Khadi cotton that is treated with white mud and rice starch. The brush used for painting is made with squirrel hair and the colors used are natural. Each panel is differentiated by the decorative borders, while trees and buildings provide a linear perspective. The stories are illustrated in a horizontal format – providing continuity to the narrative. These simple stories are transformed into stunning, and magnificent depictions of daily life. The Patua Paintings of West Bengal are a stark contrast to those of Cheriyal when it comes to their narrative. 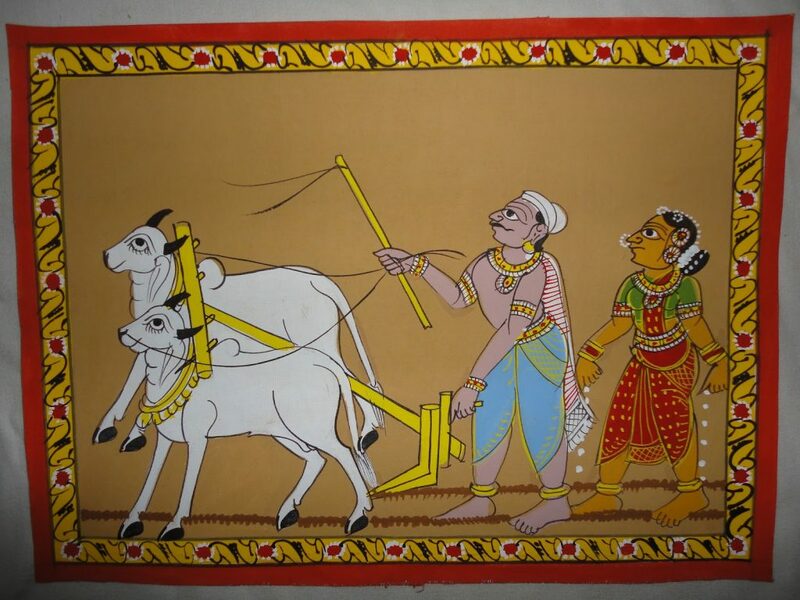 The subjects painted by the Patua artists are extremely varied. From something as minimal to a lobster eating a fish, to complex political themes of the French Revolution and, more recently the depiction of natural calamities in the form of scrolls – the Patua artists are much more versatile when it comes to content and style. The scrolls are made from sheets of white paper. The pencil outline is drawn first of the story and the characters and is later filled in with color. Once the paint dries off, its outlined with black paint, which is a distinguishing character of the Patua Paintings. After single panels have been painted, the segments of paper are sewn together and the seams seem to disappear in the scroll border. This is what differentiates the Patua paintings from those of Cheriyal, the most. The entire scroll is then glued to a recyclable piece of cloth, usually a sari to make it durable. The Patua painters are like minstrels. They go singing their stories from village to village, as they unfold the mystery, the tragedy, the comedy and the drama through their paintings. But what is the present condition of these story-telling artists now? Most of the Cheriyal painters reside in the Cheriyal Village, about 85 km from Warangal and 100 kms from Pune. The traditional craftsmen and painters are the Nakashees. As one visits the villages in the interiors of Telanagana, they would be spell bound to see scrolls of paintings on the walls of shrines dedicated to various gods. Naya– a small village in West Bengal is the home for many Patua Painters. They live in sheer poverty but the spectacular paintings on their house walls is what adds color to their lives, literally! 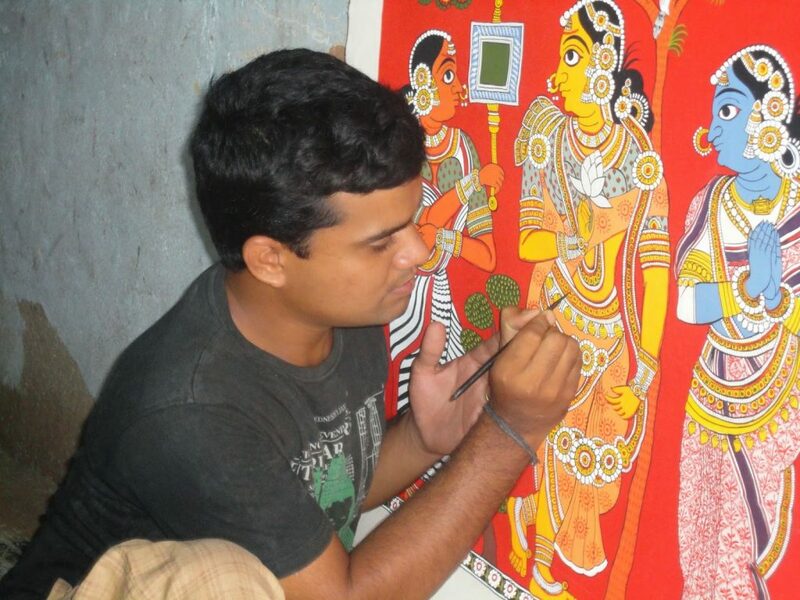 The Patua painters are believed to have more opportunities than the Cheriyal Painters. 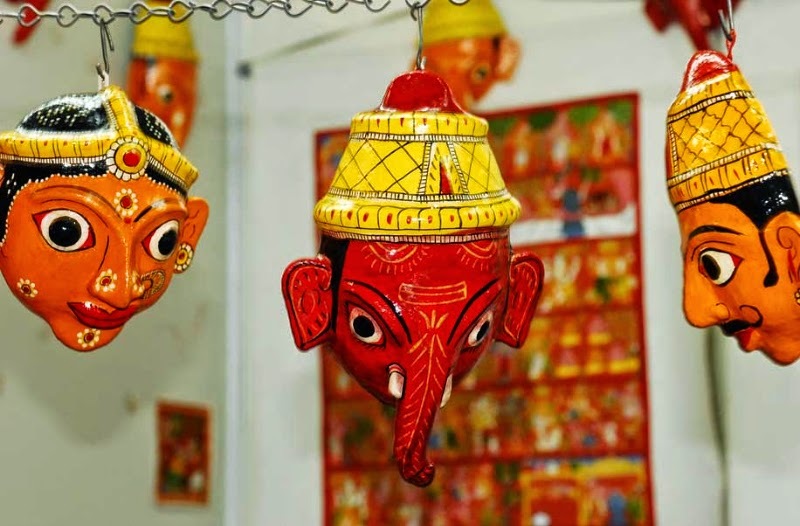 A lot of Patua Painters have been extending their horizons by displaying their talents across the country-by holding exhibitions in places like Delhi Haat. Bangla Natak, a social enterprise working towards community development through theatre and performing arts recently organized a festival in Naya, called the Pot Maya which was attended by well-to-do families from the nearby cities. 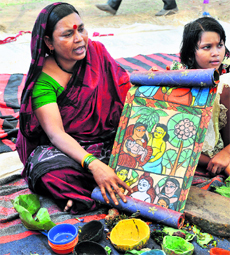 Since Patua Chitrakala has a more universal theme, the artists have now started receiving orders for textile designing. Women in Bengal can now be seen wearing saris that have the Patua art on them. Both the Cheriyal Scroll Paintings and the Patua are unique in its form, style and storytelling. With the dynamic thought process that goes behind them, the cultural complexities, the metaphors and the scroll paintings seem to engulf the whole universe on their canvas. 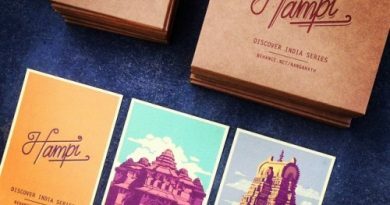 You can perhaps consider them the first story boards and graphic novels of India. The outstanding amalgamation of art, story, and narration have an everlasting impact on the mind, but unfortunately has failed to make it to the commercial markets or theatres. Is this a slow death of the art, or are art forms like these meant to stay and thrive only in the interiors of India? Don’t we need to preserve this heritage of art and culture for our future generations? 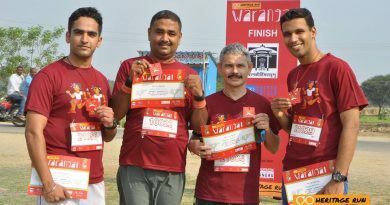 We have repurposed some of our medals made of hand painted Cheriyal art into fridge magnets you can purchase, check here – Cheriyal fridge magnets.